THE Choir from Batchley First School have performed at some incredible venues, from Symphony Hall, Royal Albert Hall and in October at Worcester Cathedral. 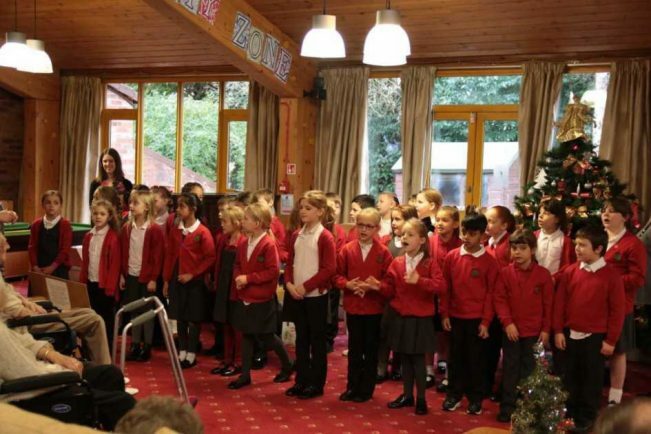 But they couldn’t turn down the opportunity to sing carols at St David’s Residential Care Home in Batchley last Wednesday. The request came from local mum Lisa Dell, a former pupil who now works at St David’s and who remembered the days she used to singthere as part of the choir. She contacted the Music teacher, Sarah Wykes and invited the children down to sing. “I was delighted when Lisa approached me with this lovely idea,” said Sarah. “There is so much value in working between the generations. We are a school that prides ourselves on our community link and Lisa and the community at St David’s made us incredibly welcome. The children decorated bags to fill with small gifts for the residents and in return received gifts from them and now there are plans for a reading programme between the residents and the school in the New Year.